U.S. General Election Day is always the first Tuesday in November. Teachers and homeschool parents, looking for free printable election lesson plans? Read on. I remember in 1972, our school was immersed in the Nixon-McGovern election. We staged debates and mock elections, explored voting booths and campaigned for our candidate. It was a great hands-on learning experience. 42 years later, we have technology and the internet to help us teach voting, elections and politics. Here are free lesson plans, puzzles, quizzes, games, writing prompts and coloring pages to explore. Ed Helper has free printable Super Tuesday lesson plans. 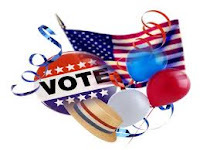 Click around for election, history and social studies unit themes. Print vocabulary, timelines, issues, electoral college, Inauguration Day and more. ABC Teach features election day lesson plans that are free to print. Click for printable voting lessons too. Print KWL charts, voting graphics, math graphing activities, creative and response writing, comparison/contrast (candidates and past elections), history and literature connections, mock election forms, debate rubrics, student senate formats, issues awareness. Look for graphic organizers on foreign policy, how to vote, timeline of voting rights, constitution, branches of government, political parties and other election-related subjects. Education World offers a sophisticated, multicultural look at the political system. Check out the interactive election activities, maps and timelines available. A to Z Teacher Stuff provides a compendium of free printable voting and election lesson plans. Scroll through till you find what you need for your classroom grade and student population. Special needs teachers, you'll appreciate these interactive election lesson plans. Hands-on activities help disabled children learn in ways that are suited to their abilities.